The Christmas break was supposed to mean rest, relaxation and a renewed energy for the Windsor Spitfires. Instead, there was a lot of head scratching as the team struggles to find its way. Before the break, the Spitfires lost four of five games and were outscored 26-15. That’s not a good look for a team and head coach Trevor Letowski and his staff had plenty of work to do. Systems needed to be tweaked, lines set and confidence renewed. However, now after the break, not much has changed. Despite the rest and relaxation, the Spitfires had their hands full before the New Year celebrations. Friday night, they opened the second half of the season on the road in London against the rival Knights. Spitfires goaltender Kari Piiroinen got the nod while the Knights countered with Joseph Raaymakers. While the Spitfires got off to the quick start on a goal by Louka Henault, the Knights got the next five on Piiroinen. The teams then traded goals until the final buzzer. The result was an 8-6 Knights win thanks to two-goal efforts by Paul Cotter and Josh Nelson. Spitfires veteran Cole Purboo had a pair of goals in the loss. Despite the goal onslaught, both Piiroinen and Raaymakers played the full 60 minutes. Raaymakers finished with 34 saves while Piiroinen had 27. Saturday night was more of the same as the Spitfires headed to mid-Michigan for a date with the Flint Firebirds. The Firebirds came in with just four wins all season, but one of those were against the Spitfires in late November. On this night, history wasn’t on the Spitfires’ side. C.J. Clarke had the opening two goals for the Firebirds as they jumped out to a 3-0 lead. While Will Cuylle and Curtis Douglas got the Spits to within one, a pair of late third-period goals gave the Firebirds the 5-2 win. Veteran Colton Incze made 31 saves for the Spitfires while Evan Morrison stopped 21 for his first win of the season. The Spitfires now have just five wins in 18 road games this season. Letowski’s fortunes didn’t improve on Monday for the annual New Year’s Eve game. The Spitfires welcomed the Mississauga Steelheads into the WFCU Centre. 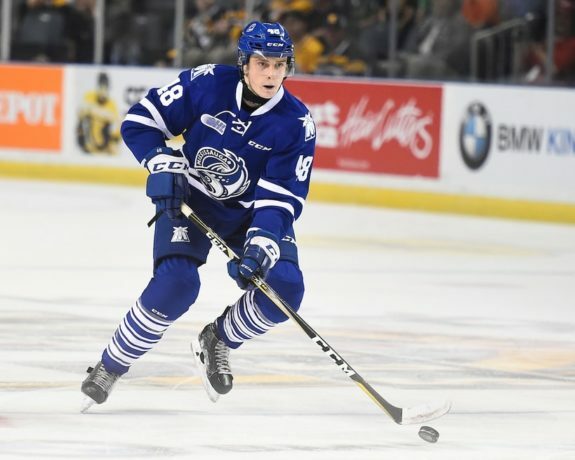 It was the Steelheads’ only trip to Windsor this season and they made the most of it. Neither Piiroinen (four goals on 12 shots) nor Incze (five goals on 22 shots) could do much against them. It seemed like anything the Steelheads touched resulted in a red light. Thomas Harley and Ryan Wells each scored a pair while Alan Lyszczarczyk had a goal and three assists to lead the charge. In total, 14 Steelheads players recorded at least one point. The nine goals against were the most the Spitfires have allowed since Mar. 15 when they lost 9-2 at home to the Owen Sound Attack. To pour salt in the wound, the Spitfires’ offence was just fine. They scored five goals on Steelheads goaltenders Matthew Dunsmoor and Joe Ranger on just 23 shots. One of them belonged to veteran Sean Allen, who scored his first of the season. On a normal night, the Spitfires would walk into 2019 with a well-earned two points. Not on this day, though. Instead, it was their eighth loss in 10 games. There’s little time to dwell on the slump. With three games this weekend, the players and coaches have no choice but to focus. On Thursday night, the Sudbury Wolves arrive at the WFCU Centre for their only game in Windsor this season. The Wolves have lost four straight but they feature 2018 first-overall pick Quinton Byfield. The six-foot-five, 214-pound center has 30 points in 31 games this season. 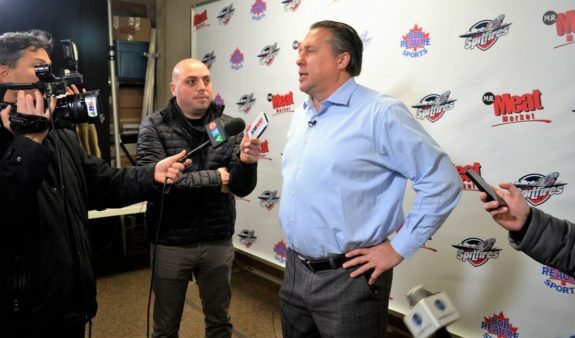 The Spitfires then hit the road Friday for a match with the Guelph Storm before finishing off the weekend at home on Sunday afternoon against the Kitchener Rangers. While the players focus on the games, general manager Warren Rychel is busy preparing for the Jan. 10 trade deadline. With the team struggling to stop the puck and offence being inconsistent all season, Rychel has a tough job ahead of him. The team is in the middle of a rebuild following their 2017 Mastercard Memorial Cup win. Finding the right combination of youth and veterans isn’t an easy task and if a youngster doesn’t fit, they won’t necessarily stick around. On Tuesday, Rychel pulled off a tough deal involving a young forward. He sent 17-year-old Cody Morgan to the Flint Firebirds in exchange for Flint’s second-round pick in 2020 and a fourth-round pick in 2021. The deal gives Morgan more playing time and it gives Rychel some picks to work with. Morgan, who came over last season from the Kingston Frontenacs in the Gabriel Vilardi deal, had two goals and nine points in 33 games this season for the Spitfires. FULL STORY: @codymorgan_28 has been traded to @FlintFirebirds in exchange for a second (202) and fourth-round picks (2021). Overage forward @lukekutkevicius has been placed on CHL waivers. Just 24 hours later, Rychel put overage forward Luke Kutkevicius on CHL waivers. He was promptly claimed by the Quebec Remparts (QMJHL). Kutkevicius had 16 points in 30 games for the Spitfires this season. With the moves, Rychel and Letowski now have 11 forwards and eight defencemen on their roster. With forward Chris Playfair still out with an upper-body injury, there could be some creative line juggling this weekend. Jan. 10 cannot come soon enough for this team. It’s one less thing to worry about.